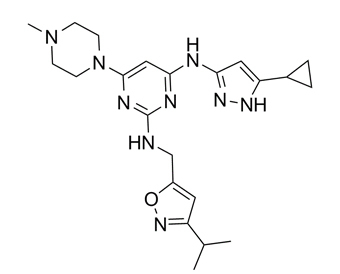 XL228 is a synthetic molecule that targets multiple tyrosine kinases with potential antineoplastic activity. Tyrosine kinase inhibitor XL228 binds to and inhibits the activities of multiple tyrosine kinases, such as the insulin-like growth factor 1 receptor (IGF1R), Src tyrosine kinase, and Bcr-Abl tyrosine kinase. Blockade of these kinases may result in the inhibition of tumor angiogenesis, cell proliferation, and metastasis.
. Douglas O, et al. Abstract C192: Characterization of the target profile of XL228, a multi‐targeted protein kinase inhibitor in phase 1 clinical development. Mol Cancer Ther 2009;8(12 Suppl):C192.